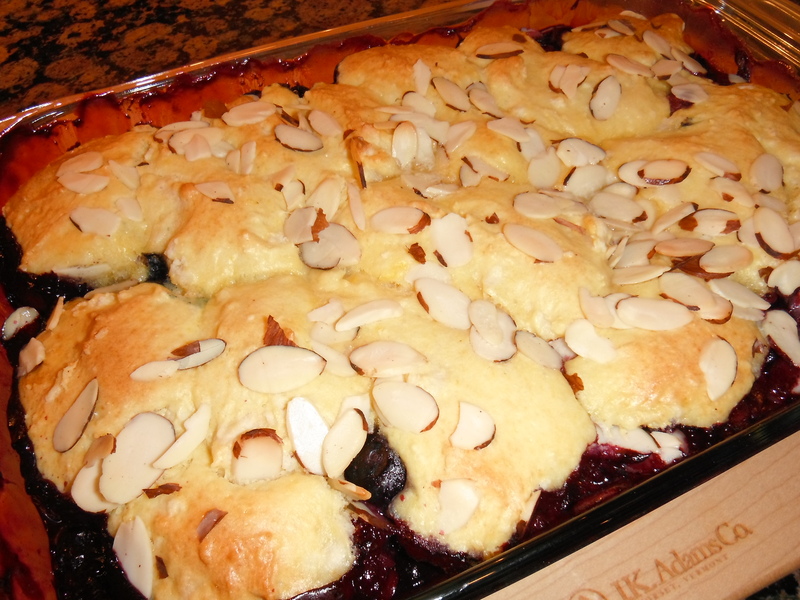 Toss berries with the filling ingredients and place into a 7×11 / 2quart baking dish. 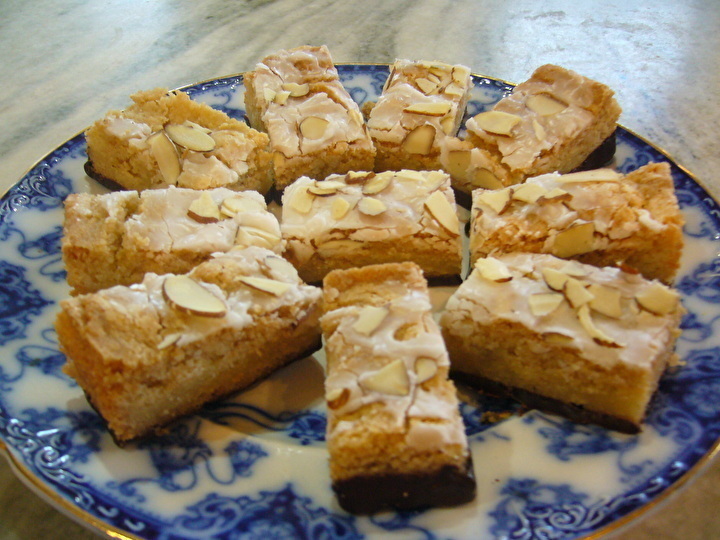 In a bowl combine the dry ingredients for the topping except the sliced almonds. Mix until combined. Stir in the egg, cream , almond extract and almond paste. Stir to combine. Place topping in dollops over the berry filling. Sprinkle the sliced almonds over the top. Evenly distribute the diced butter over the topping. Bake for about 30 minutes or until filling is bubbling and topping is golden brown. This recipe will make at least one 9 inch, one 6 inch and two 4 inch cakes. It all depends on the size and shape of the cake rings(molds) used. Preheat oven to 325 degrees. Line bottom of a half sheet pan or jellyroll pan with parchment paper and butter or spray with non stick spray the entire pan; set aside. In the bowl of a stand mixer, beat the almond paste, honey, butter and granulated sugar until smooth. Add the eggs one at a time , blending well after each addition. Stir in the lemon zest. In a separate bowl, whisk together the remaining dry ingredients. Fold into wet mixture until combined. Transfer batter to prepared pan and spread out evenly with off set spatula. Bake for about 20-30 minutes or until cake springs back when lightly touched. Remove from oven and allow to cool completely in the pan. Once cooled, turn cake out and carefully pull off parchment paper. Combine all the ingredients in a small saucepan and bring mixture to a boil. Remove from heat when sugar has been dissolved. Allow to cool completely. Place gelatin in a small bowl. Add a little bit of water to dissolve gelatin. Add as much water as needed but not to runny consistency. In a glass heat proof bowl, whisk together the sugar,eggs,zest and lemon juice until well combined. Place the bowl over a pan of simmering water (double boiler, bain marie). Do not allow the water to touch the bottom of the bowl. Stirring constantly over the simmering water add the butter when mixture is warm. Continue to stir and cook until butter is melted and mixture has thickened to the consistency of ketchup or hollandaise sauce. Remove from heat and stir in the gelatin . Continue to stir the mixture until the gelatin has incorporated into the lemon mixture. Pour mixture through a fine sieve into a bowl. Cover the top of the strained mixture with plastic wrap to prevent a skin from forming. Set aside and let cool completely in the refrigerator. In a medium saucepan , combine the gelatin and 1 cup of water and allow to set 1 minute. Cook over low heat , stirring constantly until gelatin is dissolved. Remove from heat and stir in the granulated sugar and remaining 1 cup of water and stir again until sugar is dissolved. Set aside. In a bowl whisk together the marshmallow fluff and the 2 cups of the cooled lemon filling until combined. Whisk in the gelatin mixture. Place in the refrigerator until the mixture forms mounds when spooned. In a mixing bowl beat the heavy cream until stiff. Fold into the thickened lemon mixture and combine thoroughly. Using a cake ring (rings ) or spring form pan, cut out cake circles from cooled cake. Carefully place a cake circle into the cake ring. Gently brush lemon syrup over the cake. 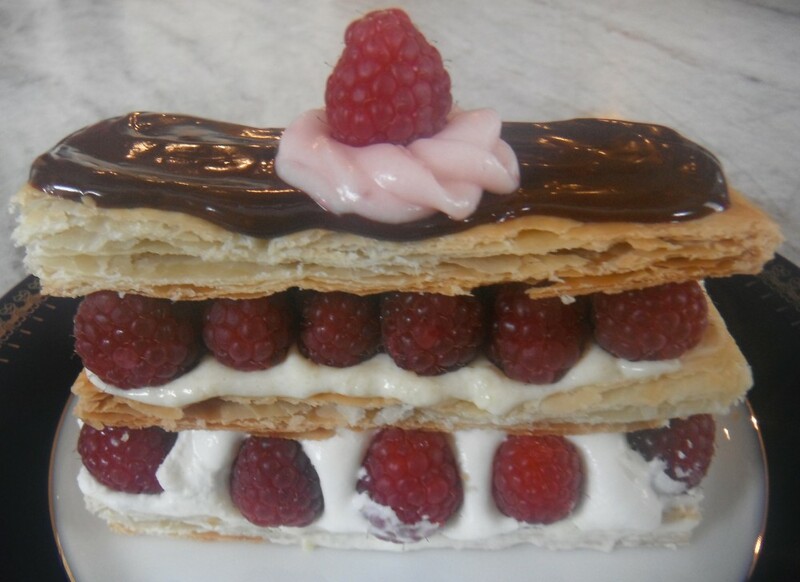 Line the outside edge with fresh raspberries. Spread some raspberry jam over the exposed cake and place randomly over cake some more raspberries. 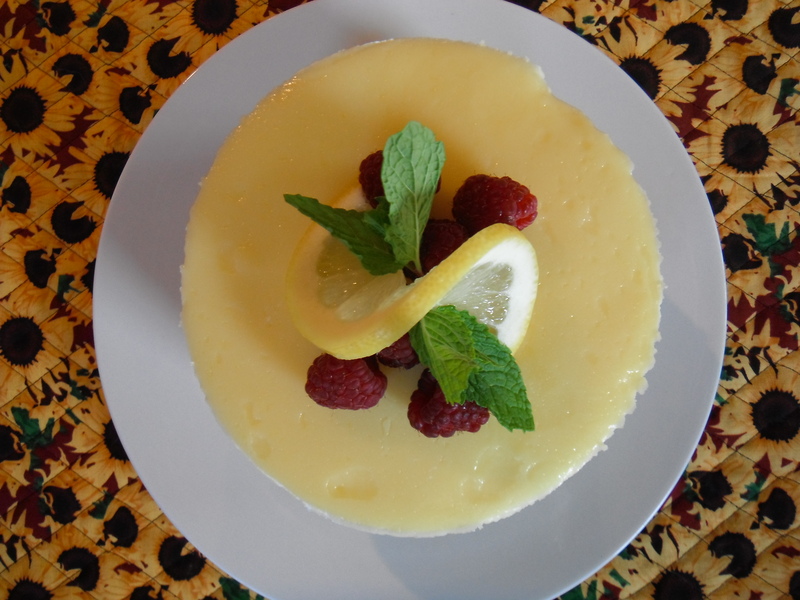 Spoon some of the lemon cream filling over the cake and raspberries and even out with spatula until level. Repeat process again until cake ring is just to the top leaving the top with lemon cream filling. Place cake in refrigerator to firm up. Once cake is firm spread a layer of lemon filling over the top of the cake. Using a flat edge of a knife or long spatula level the top of the cake with the top of the pan. Place plastic wrap over the top of the cake to prevent a skin from forming and refrigerate overnight. Garnish with fresh raspberries. Preheat oven to 325 degrees. Cut a piece of parchment paper to fit the bottom of the half sheet pan. Using a ruler, mark with a pencil the parchment divided into thirds on the long side of parchment. You should have three short rectangles. Turn the parchment upside down in the pan so that the pencil marks are facing down, yet you should be able to see the lines through the other side. Line a half sheet pan with parchment paper and spray entire pan with nonstick cooking spray. Set aside. In the bowl of a stand mixer cream together the almond paste, butter, honey, and granulated sugar until smooth. Add the eggs one at a time beating until combined after each addition. In a separate bowl whisk together the flour, spices, salt and baking powder. Fold into creamed mixture. Divide batter evenly between three bowls. Keep one bowl plain batter. Add the 1 tablespoon of raspberry preserves to the second bowl; mix until combined. Add the 1 tablespoon cocoa powder to the third bowl and mix until combined. Transfer the batters to the prepared pan , having each marked area for each flavor of batter. Carefully spread the batter out the fill each rectangle. The end result should be three separate blocks of cake. Bake for about 20-30 minutes until done. Top should be slightly golden and cake spring back when touched. Remove from oven and allow to cool in pan on rack. Add the sugar and water to a small saucepan. Place over medium heat and heat until sugar is completely dissolved. Set aside to cool. There will be syrup leftover. Place extra in a jar and store in refrigerator for later use in things such as drinks or other baked goods. Flip the cooled cake onto a cake board . Cut the three cakes into the three separate flavors and trim the edges so that they are all the same size. Place the chocolate layer on a cake board. Lightly brush the simple syrup over the top. Spread a layer of about 1/3 of the raspberry preserves over the top. Top the chocolate layer with the plain layer and repeat the same process as done with the chocolate layer. 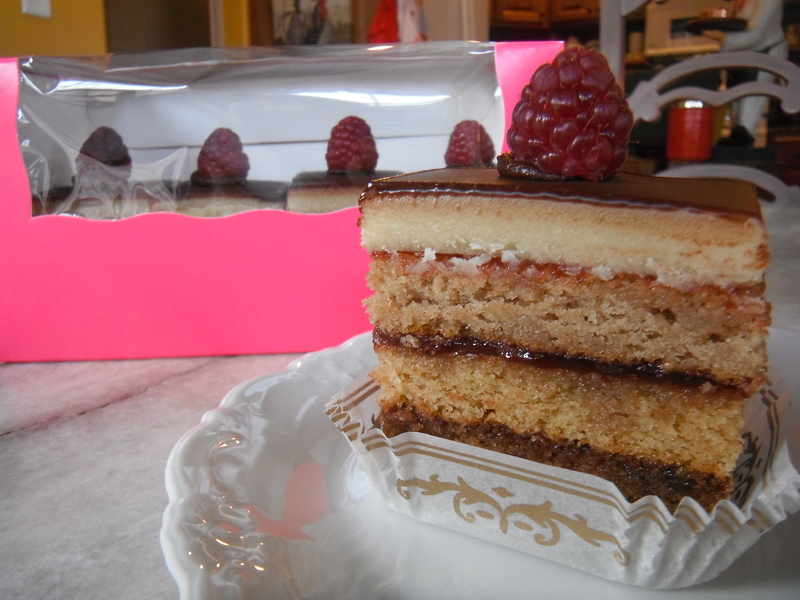 Top the plain layer with the raspberry layer. Brush the top lightly with the simple syrup. Spread a thin layer of preserves over the top, much less than the previous two layers. The preserves are simply acting as a glue for the almond paste. With remaining almond paste , knead until smooth. 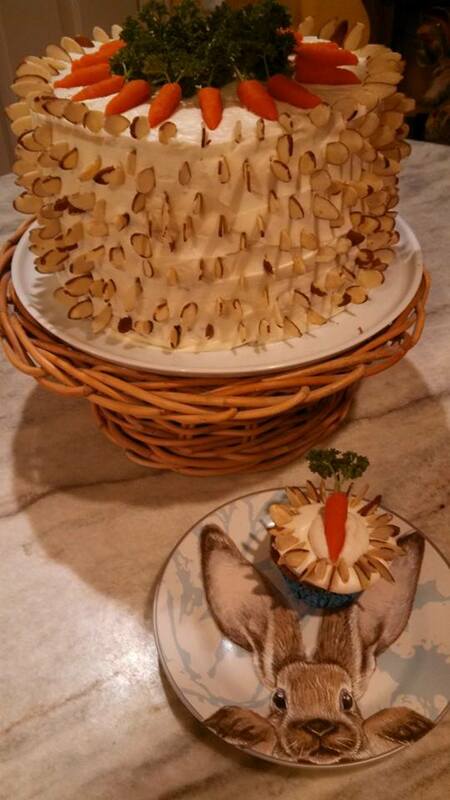 Using a rolling pin, roll out the almond paste to the size of the finished stacked cakes. Carefully place on top of final layer. Make the ganache by heating the cream and butter just until cream is about to boil but not boiling. Pour this mixture over the top of the chopped chocolate and vanilla bean paste. Stir until well combined, smooth and shiny. Spread a thin layer over the top of the almond paste. You will not use the entire amount of ganache. Same leftover in refrigerator for later use such as, truffles, hot chocolate and the like. Place the completed cake into the freezer . Leave in freezer until firm. Once firm , remove from freezer and trim or clean up any rough edges with sharp knife. Working quickly , heat a long knife using very hot water and cut cake into 12 equal square pieces. Clean knife between each cut , creating clean sharp edges. Using a small amount a ganache as glue . Place a fresh raspberry on the center of each cake. Store in refrigerator . Allow to come to room temperature when serving. In a stand mixer, cream the butter and sugars. Add egg; blend well. Slowly add dry ingredients and blend until well combined. In a 9×13 pan lined with parchment paper, spread half the base dough into the bottom of the pan. In a separate bowl blend together the almond paste and sugars until well combined. Add egg , salt and almond extract and beat until well combined. Pour over base in pan. With remaining base dough scatter in small pieces evenly over the top. Base dough is sticky. Place in oven and bake for 45-50 minutes or until golden. Remove from the oven . Meanwhile combine all the icing ingredients and spread over hot bars. Quickly sprinkle the nuts over the top. Allow to cool completely. Using a knife loosen edges and remove bars from pan. Prepare the chocolate coating by carefully melting the chocolate and shortening in the microwave in 30 second increments. Stir until glossy. Dip the bottoms of the bars in the chocolate coating and place on parchment paper to set up. 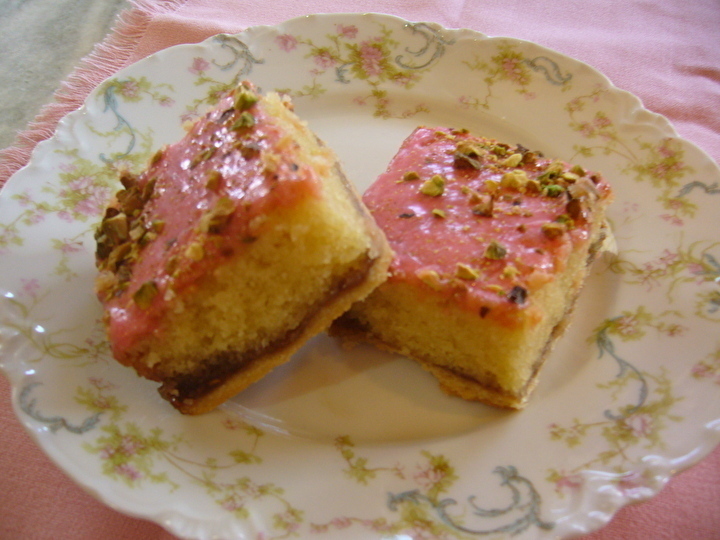 Almond Pink Rose’ Bars-Just a tiny hint of rose water makes them delicate in flavor. Grease and flour a 12×18 jelly roll pan. Cream the butter and sugars until fluffy. Add the egg yolks and vanilla. Blend in the flour, cardamom, and salt. Press evenly into the bottom of the prepared pan. Bake until golden, for about 20 minutes. Remove from oven . Spread the raspberry jam over the top. Prepare the almond filling. In a bowl of a food processor fitted with a metal blade, process the almond paste with the eggs , one third at a time until smooth. In a bowl of a mixer, cream the butter and sugar. Blend in the almond mixture and vanilla. Add the flour and salt. Beat until smooth. Pour mixture over the jam-covered crust. Bake for about 35 minutes, or until the center feels quite firm to the touch. Beat all the icing ingredients except the nuts. Blend well until combined. Sprinkle the nuts evenly over the top. Cut into bars once the icing is completely set. Preheat oven to 350 degrees. Grease and line a 9×13 pan with parchment paper. Combine all ingredients except the jam in a bowl of a food processor fitted with a metal blade. Process until well combined. Press evenly into the bottom of the prepared pan. Partially bake just until lightly browned, then spread with the jam. In a bowl of a food processor fitted with a metal blade, combine all the batter ingredients and process until smooth. Pour over the top of the jam topped base. Bake for about 20 minutes or until golden brown. Remove from oven and allow to cool completely before adding topping. Melt the chocolate, add the butter, sugar, cream and espresso. Whisk until smooth. Spread evenly over the top. 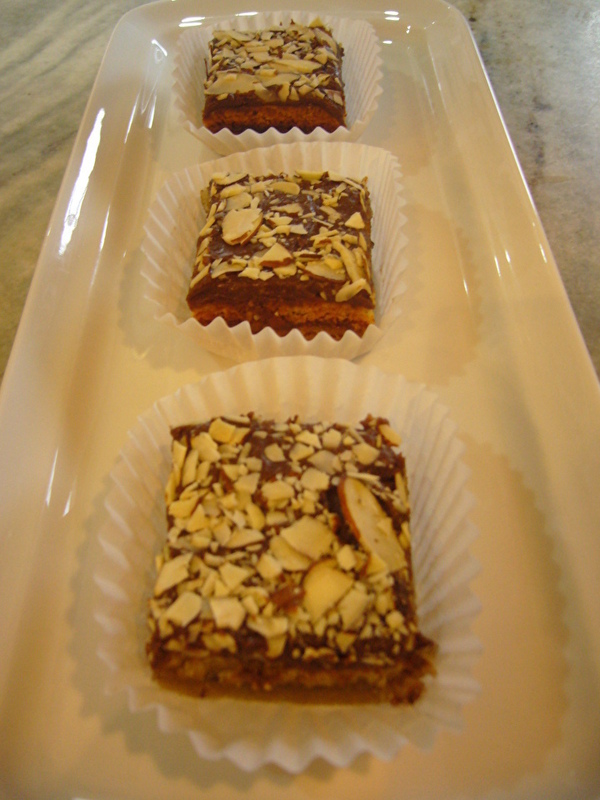 Sprinkle the ground almonds over the top and slightly press into topping. Cut into squares.